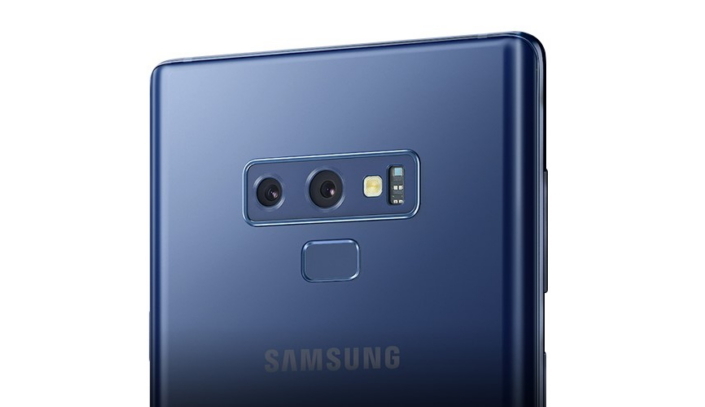 The Galaxy Note9 builds on Samsung Electronics’ legacy of innovative camera technologies with an intelligent camera that takes the work out of capturing the perfect photo. Brand new functions including Scene Optimizer and Flaw Detection utilize artificial intelligence to help users get the most out of the device’s advanced camera. Together, this powerful combination of smarts and specs makes it easier than ever to snap stunning shots. Picture this: When catching a sunset during your vacation, you snap a pic with your phone only to find that the image on the screen hasn’t quite captured the majesty of the moment. The Galaxy Note9’s new Scene Optimizer function makes it easy to photograph breathtaking moments just like this by automatically optimizing camera settings to capture the full beauty of the scene. 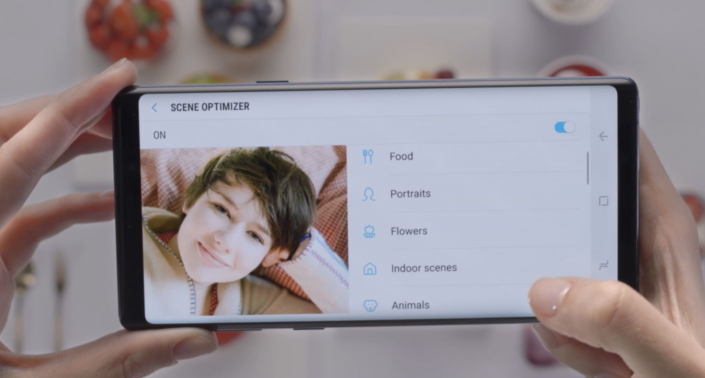 Scene Optimizer utilizes deep-learning technology to analyze objects, scenery and time elements in the camera’s frame in order to identify exactly which type of scene you’re about to photograph. The function is currently capable of recognizing 20 types of scenes—including ‘Food’, ‘Flowers’, ‘Indoor scenes’ and ‘Landscapes’— and automatically adjusts the color tone based on how the scene is classified1. The function corrects the saturation, white balance, brightness and contrast in order to provide the best possible image. And because it does not require a network connection, it’s always available to help make your photos look great. Even the best photos can be spoiled by a simple blink, a blur, a smudge on the lens, or by harsh, overpowering light behind the picture’s subject. That’s where the Galaxy Note9’s Flaw Detection function comes in. Once a photo has been snapped, the feature automatically scans it for flaws and notifies you if any are found2. The function helps users capture and save more memorable moments by ensuring that the picture they take is the best possible shot. Say you’re enjoying a special evening with friends and decide to immortalize it with a fun photo. Rather than realizing later that your eyes were closed, with Flaw Detection you’ll be immediately informed of any flaws in your photo so you can capture the memory with an additional shot. Whether we’re at a restaurant, a concert, or simply enjoying a balmy evening under the summer sky, we’re constantly snapping photos in low-light environments. 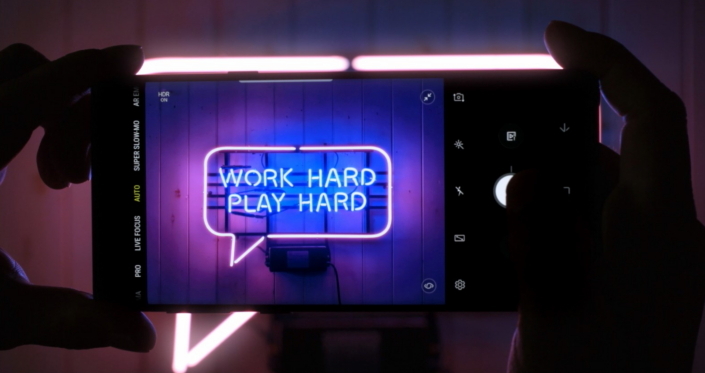 That’s why Samsung outfitted the Galaxy Note9’s camera with an array of innovative technologies that allow it to produce stunning shots day or night. Combining an F2.4 aperture lens with an F1.5, the brightest currently available on a smartphone, the Dual Aperture lens automatically adjusts to light just like the human eye, letting in more light when it’s dark and less when it’s bright to produce images that are crisp and clear. The Galaxy Note9’s multi-frame processing technology adds further clarity to photos taken under less-than-ideal lighting conditions. 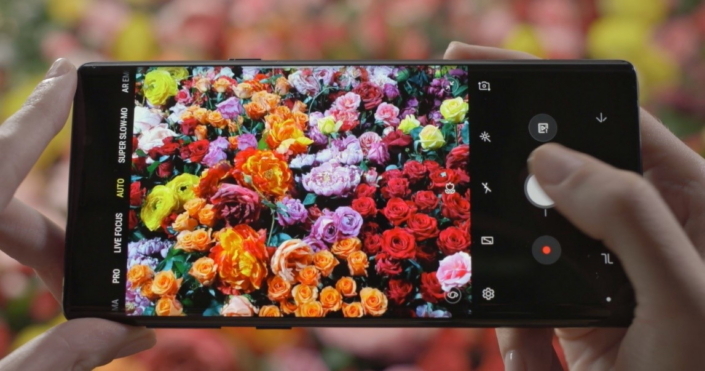 This technology, which combines several photos into one to create an optimal image, allows the camera to provide better HDR at night, and enriches the Live Focus feature with improved brightness and noise when taking pictures in low-light environments. 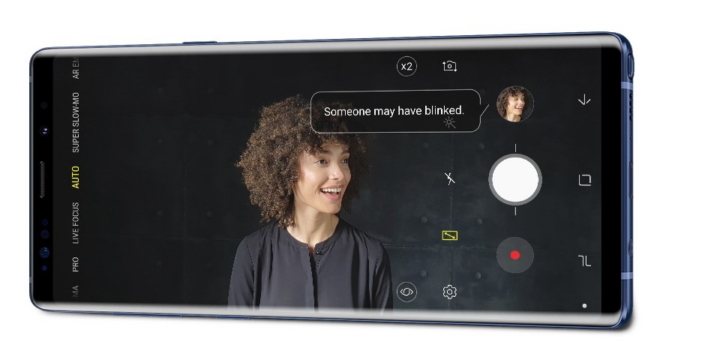 The Galaxy Note9’s camera also includes support for Samsung’s recently introduced Super Slow-mo function, which ramps the camera’s shutter speed up to 960 frames per second to allow users to record spectacular slow-mo videos. Four times slower than traditional slow-motion video, Super Slow-mo is powered by the camera’s Super Speed Dual Pixel image sensor, which supports much faster image processing thanks in part to its integrated DRAM memory chip. The feature also includes an automatic Motion Detection function that instantly starts recording as soon as it detects movement. 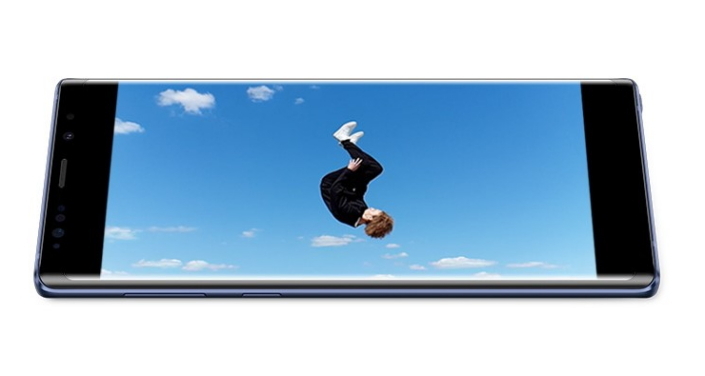 The Galaxy Note9 allows users to transform 0.4 seconds of footage into approximately 12 seconds of Super Slow-mo video when taken in single shot mode3. Once a video is recorded, the feature automatically adds appropriate background music that makes the recorded moment even more epic. The Galaxy Note9 is absolutely packed with innovations that empower users’ creativity and self-expression, and the camera’s refined AR Emoji feature is one of the most dynamic examples of this. Capable of mimicking users’ movements in addition to supporting dozens of pre-set expressions, AR Emoji stickers offer a fun way to express yourself and inject personality into messages. The Galaxy Note9 analyzes your distinct facial features to generate a 3D avatar that matches your appearance. The feature, whose face-tracking function was recently enriched with more landmark detector points, has been enhanced for the Galaxy Note9 with an array of customization options that make it easier for AR Emojis to copy your distinct style. With loads of new outfits and accessories to choose from, as well as the ability to fine-tune details like your hair style, skin tone and facial features, the opportunities for expression are endless. Galaxy Note9 users will also be able to customize the backgrounds of their stickers with an array of new options, and enjoy access to Samsung and partners like Disney’s ever-growing roster of AR Emojis based on iconic cartoon characters—a roster that’s set to become even more fun and diverse with the feature’s open SDK (software development kit). The front facing camera needs a lot of work. In good lightning conditions is fine but indoors or at night is trash, sorry. It keeps over smoothing faces and losing details. The selfies focus is bad. Samsung REALLY has to work hard to deliver a software update to improve the quality of the front facing camera from Note 9 all the way down to S8 and even S7. Also, why was sports mode removed from Note 9 and also the ability to put the modes of choice in the home screen as shortcuts?